Zouk classes – 50% OFF for ladies! If you have never attended our Zouk classes in CBD your timing could not be better! On February 2nd and on February 9th you can buy a Class Pass with 50% discount. The First trial class is still FREE! Location: 240 Franklin Street, Adelaide, studio upstairs. YOUR SELF Dance School as a Part of International Zouk FlashMob 2015! On September 19th 2015 thousands of people from 120 cities in 39 countries danced in celebration of International Zouk Day! We are on 7:36 min Australia – Adelaide!!! Big Thanks to Gerry Ekserdjian for making it happen. New Bonus System (Brazilian Zouk classes from 2016)! – the Bonus applies once only. – the Bonus applies only if your friend purchases a Class Pass. – the invited friends can also attend a Free trial class before purchasing a Class Pass (only for level Basic 1). From 2016 Student Card holders are eligible for concession fees on Brazilian Zouk dance classes in our Dance School! For more information check out our Prices. Welcome to YOUR SELF Dance School! 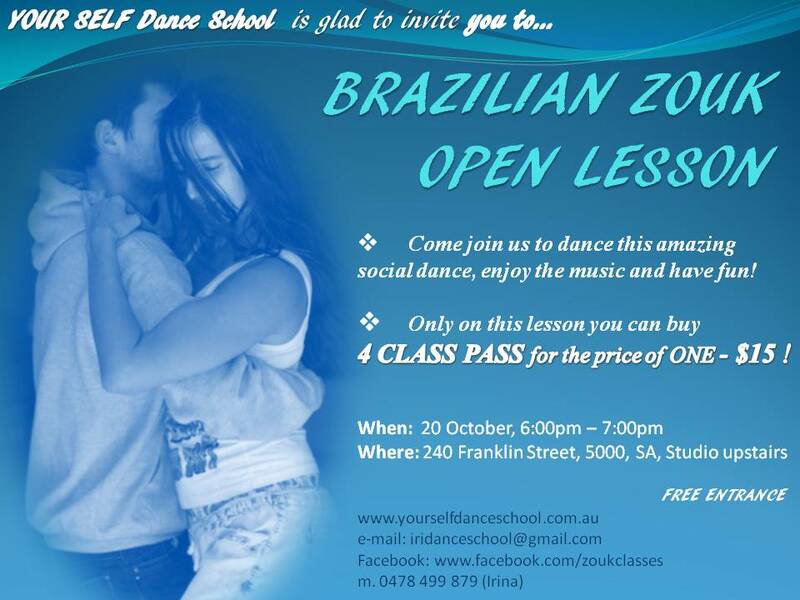 Our dance school is happy to invite those who are into partner dances to Brazilian Zouk dance lessons. Come try this amazing dance – First class is free! Specially for Ladies! YOUR SELF Dance School offers Latino Mix dance classes (Lady Style). Develop your style in dancing, express yourself through dance moves, let your soul to dance! YOUR SELF Dance School is happy to introduce you to the World of Social Dancing in Adelaide! Come join us to dance, make new friends and have fun! Feel alive, inspired and energetic with YOUR SELF Dance School! We did it! International Zouk Flash mob in Adelaide! YOUR SELF Dance School is glad to invite you to a Brazilian Zouk OPEN LESSON! Zouk is a partner dance with sensual and graceful movements originated in Rio de Janeiro. Come join us to dance this amazing social dance, enjoy the music and have fun! Only on this lesson you can buy 4 CLASS PASS for the price of ONE – $15 (for the new group -level Basic 1, start 27 October, 6:00 pm – 7:00 pm).